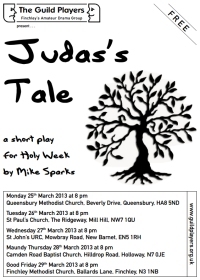 The Guild Players are part of Finchley Methodist Church and for the past few years we have produced a small scale production in the Church in the week before Easter. 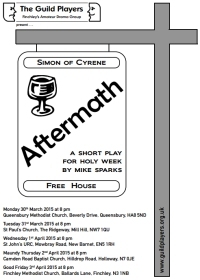 From 1998 to 2001 we presented a programme of readings and reflections for Good Friday in a format similar to a radio play, but with music and lighting in addition to the words. 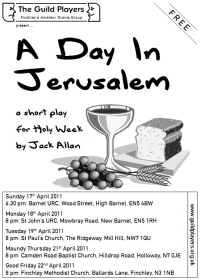 These productions were toured to Camden Road Baptist Church during Holy Week, as well as being performed at our own home base in Finchley on Good Friday. 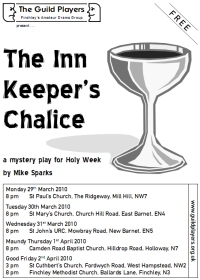 For 2002 we produced a more complex production, a modern language version of a mystery play, which we presented at four church venues during Holy Week. 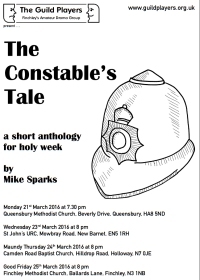 Our 2003 & 2004 productions returned to a programme of readings, reflections and music. 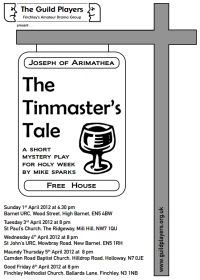 Short modern 'mystery plays', "An Inn Keeper's Tale", "The Soldiers Tale", "The Gardener's Tale", "Peter's Tale", "Caiapas", "The Inn Keeper's Chalice", "A Day In Jerusalem", "The Tinmaster's Tale", "Jusdas's Tale", "Pilate's Wife" & "Aftermath" were performed at various North London churches during Holy Week from 2005 to 2015. 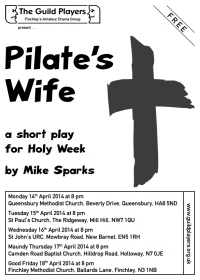 The scripts for most of the holy week mystery plays were written by Mike Sparks for the Guild Players. Copies are available from the publishers, Lazy Bee Scripts.